Flavor Text: Staying alive despite the intense cold and icy winds took a person with a strong constitution and will to survive. I feel like the deckbuilding restriction this requires is too heavy for what it offers, especially because it can just go insane unless it gets will power from Roald Ellsworth (SoK). I don't think anyone would cut a 2nd faction for this card, so effectively you decide first if you're playing a mono deck with an Explorers theme and that tells you whether to include it. I think a larger problem with this card is that if you are building a mono-themed miskatonic deck, the extra arcane symbols are prolly not the symbols you'll be lacking. True, but she still has CAI and inherits all the bonuses from all the other Explorers. That seems like reasonable value for cost 2. Actually the MU Explorers do not have that much of Arcane. Beside this one here there are 2 other with just 1 arcane. So it offers exactly what they need. While most of them are unique, you need them ready for defending, if you have an Explorer themed deck and not so many other MU characters for this purpose. Just remember, even if you are running a mono-Miskatonic deck, if any of your characters go insane then they lose their faction and you lose Arctic Ethnologist's benefit until they restore. Last night this card earned the local nickname "Ethical Proctologist". 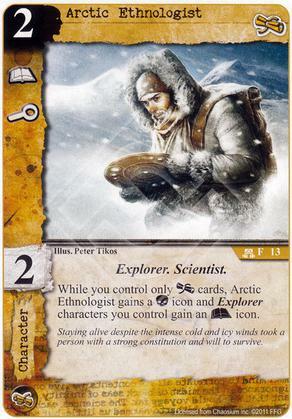 If I have 2 copies of Arctic Ethnologist in play and only control MU cards, does each Arctic Ethnologist gain 1 or 2 Combat Icons? Thanks. It isn't worded like "Alaskan Sledge Dog gains a C icon and +1 skill for each card titled Alaskan Sledge Dog in play." so that makes sense. Kosing the benefits if any character goes insane makes this card less useful.